Each month, NIA deploys E-News Bulletins (ENBs) to our members and subscribers, as well as emails related to special events and programs, such as Convention and Fall Summit. Monthly ENBs reach the largest available audience, including members, regional organizations, and industry subscribers who sign up. NIA also offers special events and publication-related emails blast that reach NIA members who want to stay up to date on association and industry news. Position your company as an industry leader and promote your brand to our readers! Find out how we can help your company by contacting the Publisher, Julie McLaughlin, at jmclaughlin@insulation.org. 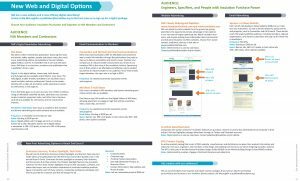 Click here to learn more about all of NIA's digital advertising options.